‹ Fine, facebook. Have it your way. So after six years of living la vida propane, it’s back to an electric stove for me. That isn’t nearly the concern that being unable to use my counterflow chiller is. I was pretty sure that the stove wouldn’t be able to boil 6.5 gallons of wort anyway, so I devised a technique that (I feel) neatly solves both problems. Reduced hop utilization, due to the higher specific gravity. Greater perceived maltiness due to melanoidin formation from the high (heated) surface-to-volume ratio. Increased darkening of the wort, resulting from increased Maillard reaction rates. Diacetyl formation from Maillard products. Reduced fermentability, again due to Maillard product formation. Inclusion of hot/cold break and hop material in the fermenter, since I’m not whirlpooling or chilling in the kettle. In order to evaluate these effects as best I can, and to get some beer on tap quickly, I chose to brew an American Blonde Ale with an OG of 10°P (1.040 SG). My expectation, however, is that with an average boil gravity of only 16°P, any negatives will be minimized. This also provided an opportunity to experiment with a new hop varietal, Palisade, and my new base malt, Cargill Special Pale. That makes this recipe an educational, albeit infuriatingly named, “SMaSH” beer. Three days before brewing, I boiled 2.5 gallons of water, which Wolfram|Alpha assured me would result in 5.5 gallons of wort at my target pitching temperature of 17°C (63°F). Aside from needing the ice, this gave me an opportunity to verify that my stove is up to the task of boiling almost four gallons of wort. I was actually surprised by how well it did, heating the water by a nearly constant 2°C per minute, which works out to about 1300 W of power. Allowing for losses, I surmise that the cooktop is designed to nearly max out a 20 A circuit when on “HI”. After a couple hours in a snow bank, the water had cooled to about 50°C, and I split it between three zipper-top plastic bags, which went back in the snow to freeze overnight. Fast forward to the actual brew day, which was remarkably stress-free. Thanks to Kai Troester’s work, I was able to model the efficiency of the no-sparge mash (projected 71%, actual 70%) very precisely. The rest of the brewing process went normally. Immediately after flameout, rather than my normal whirlpool/chill, I simply cut the bags away from the ice, put the ice in the fermenter, and poured the wort on top. If you wanted to skip yet another step, you could probably pour the hot wort in first and let it stand a few minutes, avoiding having to sanitize the fermenter. Personally, I’m just not wild about the idea of having near-boiling wort in contact with the plastic for any longer than necessary. After nine minutes, assisted by some gentle stirring, the majority of the ice had melted, and the wort had dropped to 68°F. I aerated for 10 minutes, pitched the rehydrated dry yeast, and left the fermenter in a closet with a space heater set for 64°F. Really, the only wrinkle was that I seriously undershot my pitching temperature target – the wort stabilized at 48°F (9°C). It’s an embarrassing oversight on my part, but apparently the specific heat capacity of wort is much lower than that of water. (In case you’re wondering, c = 3.5 J/g-°C, at least in this case.) But a clean fermentation profile is far from a flaw in this style, and as I can unfortunately attest based on my recent experiences at the brewery, US-05 will happily ferment at these temperatures. As of now, 18 hours after pitching, the fermenter has warmed to 64°F, while still in the lag phase. Aside from being able to brew instead of, you know, not being able to brew, the most significant benefit I see to using this method is the time savings. From lighting the burner to finishing cleanup, the process took just under three and a half hours. Even allowing for the time needed to make the sanitary ice, using a partial boil reduced the total time investment. I would never advocate sacrificing beer quality in order to save time, but at this point I have to conclude that a brewer interested in transitioning to all-grain brewing not only doesn’t need to move off the stove, he may not want to. The only equipment needed would be a mash tun – which, as Denny Conn will attest, can be a very minimal investment. Only time will tell if any flaws emerge as a result of using a partial boil in a beer this light. If not, I would have no reservations when it comes to applying the basic technique to other, more aggressively flavored styles. My hope is that, come spring, I’ll be able to brew 10 gallon batches using my existing outdoor equipment. wait… your stove was heating it at a consistent rate, but doesn’t hot water require more energy to heat than cold? Kind of. Specific heat capacity does vary with temperature, but it’s in the third or fourth decimal place. Quick question: On your Wolfram Alpha formula, what is the 1.08 on the right side of the equation? The rest makes sense, but that one i can’t get. I would have expected potentially a volume correction, since the wort is hot and will contract, but 1.08 seems to be on the wrong side of 1.0. 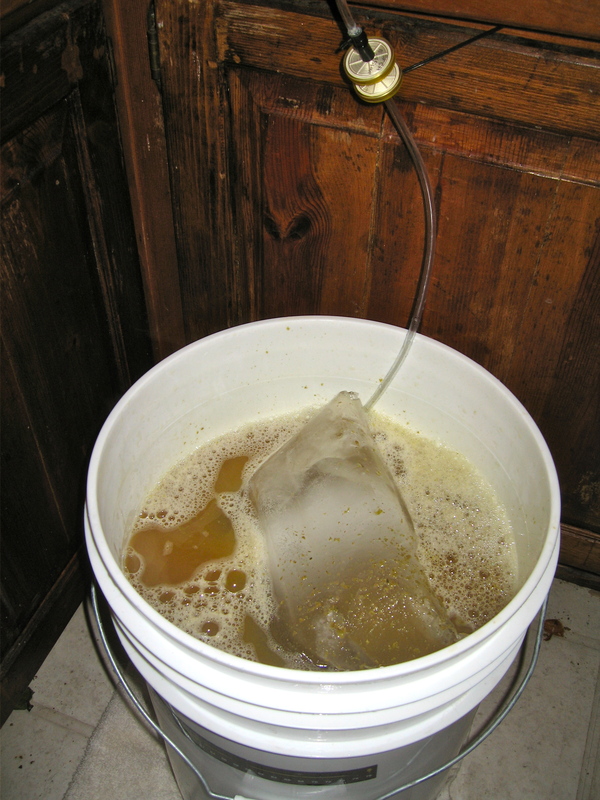 The factor of 1.08 is the wort gravity. Since specific heats are on a mass basis, I thought the 8% difference was significant enough to include in calculations. The reason the wort contraction isn’t included, by the way, is because the ice expands by about the same amount during freezing, so the terms cancel out.